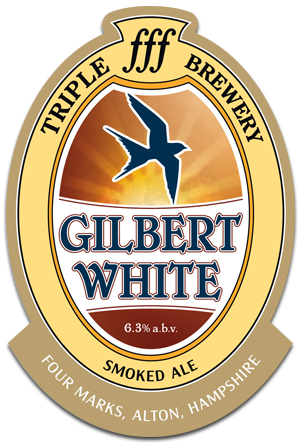 A Smoked English pale ale based on an original recipe from a local 18th century botanist and brewer. A blend of Maris Otter, Munich and wood cured smoked malt with premium English hops gives an insight to ale of the 18th century. Delicately smoked, reminiscent of an Islay whiskey. Juicy Fruit and warming alcohol with a gentle bitter finish. To be sipped and savoured or partnered with any chargrilled or smoked food. Amber color, white head. Bitter taste with citrus, peach, floral hops, toast and a bit of pine. Bitter finish with citrus and fruits. Excellent real ale. Cloudy dark caramel colour. Nice smoky flavour. Also quite sweet. Very good. Hazy gold. Not a pretty beer to look at. A strange aroma of honey, cheese and smoked bacon. Malty taste with medium to strong bitterness and a general background of pork scratchings. I'm unconvinced that this is anything like the beer they drank in 18th century Hampshire, however I enjoyed the eclectic experience.